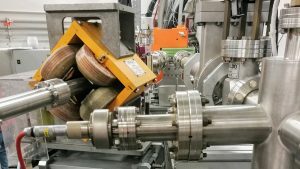 After a one-year shutdown for building a second beam-line, the Beam-Test Facility has resumed operations on the completely rebuilt BTF-1 line in July 2018.The new BTF-1 line is devoted to both low and high-intensity beam, for medium-long duration experiments. After recommissioning, the BTF-1 is now delivering 550 MeV positrons for the PADME experiment, with long (200 ns) linac pulses. BTF-2, the upgrade of BTF-1, will be devoted to low-intensity (up to 106 particles/s) and medium-short duration experiments, with both electron and positron beams. At a later time, tagged photons will be available. After completing the refurbishing of the infrastructure, the linac beam will be shared with the DAFNE collider operation, in the short bunch (10 ns) configuration. In view of the start of the BTF-2 line, interested users are welcome to submit their proposal using the usual online form: http://www.lnf.infn.it/acceleratori/btf/request.html. Proposals will be evaluated by the new BTF Users Committee. In collaboration with the CERN and DESY laboratories, in 2020, BTF will host the international initiative addressed to schools “Beamline 4 Schools”, providing the beam-line for the experiment performed of the school which will win the selection.